yiannis krikis (thessaloniki, Greece) on 2 December 2009 in Landscape & Rural and Portfolio. Quels beaux paysages d'hiver ! Oooo....how pretty. Love that pink misty sky. Some trees that are commonly found in nature always beautiful. In your photo appear painted with soft colors! Love the mood. Absolutely stunning! Delicate nature. Lovely colors ! Love that light and those beautiful trees. Nice! That lovely pink glow is wonderful. love the misty background and intrigue patterns of the branches - simply lovely!!! 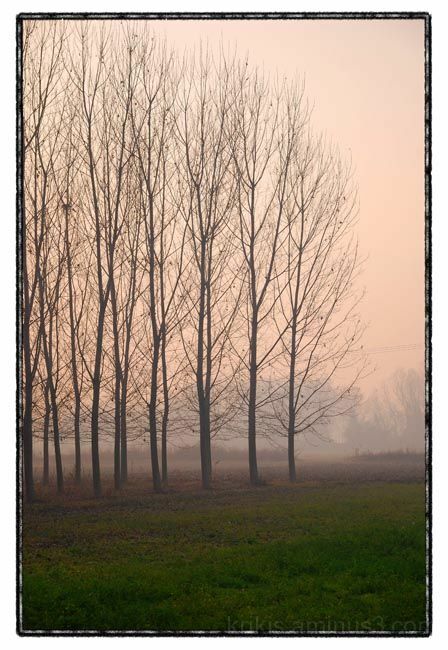 Fog and the beautiful arrangement of the trees standing... The credit goes to your framing of the shot. the colors in this are amazing! feels like the pink and green are singing off each other. The light and the scene ... exquisite.